I swear, when Michael Ruhlman’s book Charcuterie came out five years ago, I fully intended to make a project out of preparing all the recipes and training myself in the art of sausage, bacon, pate and the like. 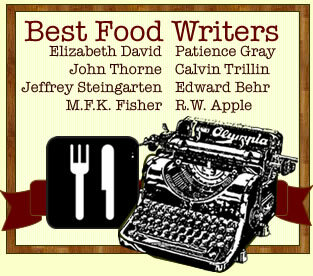 But you can’t hardly blink in the food blogosphere without someone taking ideas like that and making a splash with them. Thus, I have been seriously upstaged by something called Charcutepalooza. Perhaps you saw the huge spread on it the Washington Post recently published in its food section. Okay, I normally keep a safe distance from the latest food trends. 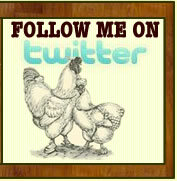 But in this case I’ve swallowed my pride and joined a zillion other bloggers who’ve signed on to Charcutepalooza, which plans to spend the next year leading readers through monthly meat preserving projects. As it turns out, I missed the January project–duck prosciutto–but I’m all over February’s focus on bacon. 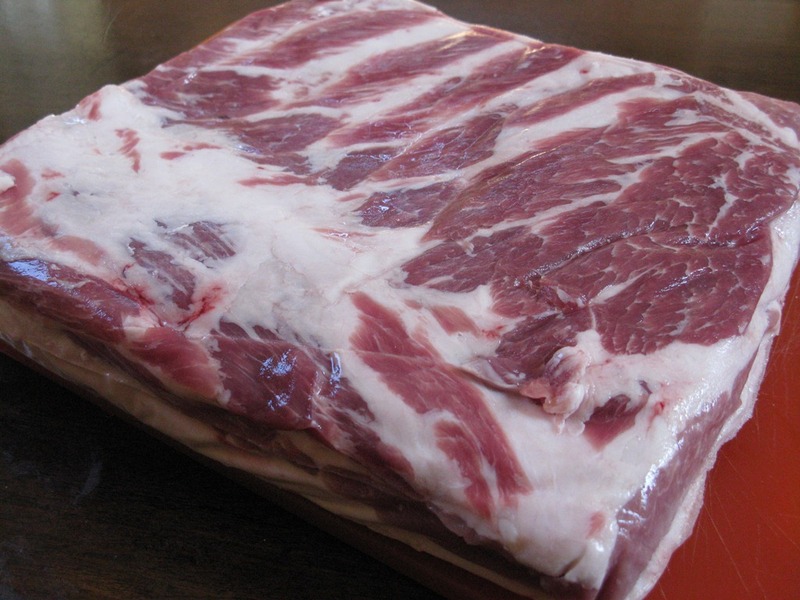 The first trick to making bacon at home is finding the five pound slab of raw pork belly Ruhlman’s recipe calls for. This is not something you normally see in the meat aisle at Safeway. But here in the District of Columbia, we have an upscale farmers market at Dupont Circle (about a mile from the White House) that stays open Sundays all year long. One of the vendors is Bev Eggleston, he of Ecofriendly Foods, the same guy who partnered at one time with famed renegade farmer Joel Salatin and was written up in Michale Pollan’s Omnivore’s Dilemma. 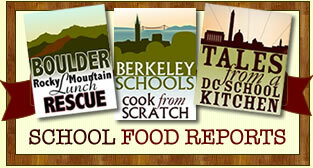 Bev supplies a number of restaurants on the East Coast with meats grown on family farms in central Virginia. I stopped by Ecofriendly’s stall a week ago and a guy in a white jacket and a baseball cap handed me his business card and suggested I call on Wednesday or Thursday. Well, that turned out to be Bev Eggleston. I was unable to get him on the phone, but I did succeed in placing my order for a slab of pork belly. I was told it would be on the truck on Sunday. 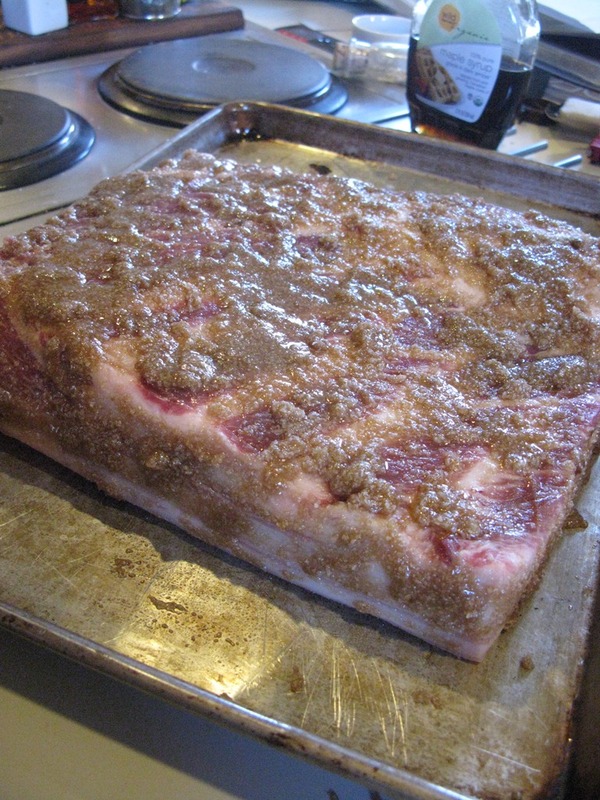 Sure enough, yesterday I was handed a package containing 6.6 pounds of pork belly, skin on. Bev was there again and gave me a small break on the price: $41. He also insisted that if Charcutepalooza had any hope of succeeding, it would need to adopt some sort of rock music anthem as theme music. “You’ve got to have a rock song,” he said. So I hereby adopt Bev Eggleston as my spiritual advisor in this endeavor. “I’m a big believer in inter-dependence,” he said, giving me a fist bump. I’ll second that emotion. Pork in hand, you’ll need a few simple ingredients, one of them being “pink salt,” otherwise known as “curing salt” or sodium nitrite. It helps preserve the red color in meat. I already had some on hand, purchased at one point on-line from an outfit called The Sausage Maker in Buffalo, N.Y. From the name, you can probably guess they carry everything you could possibly need to make sausage and otherwise cure meat. At this point, our erstwhile bacon isn’t exactly pretty to look at. But the point is to cure it for a week and get it ready for smoking. To this end, you’ll want to slide it into an extra-large plastic bag. But I was concerned about losing too much rub trying to get the pork into the bag. 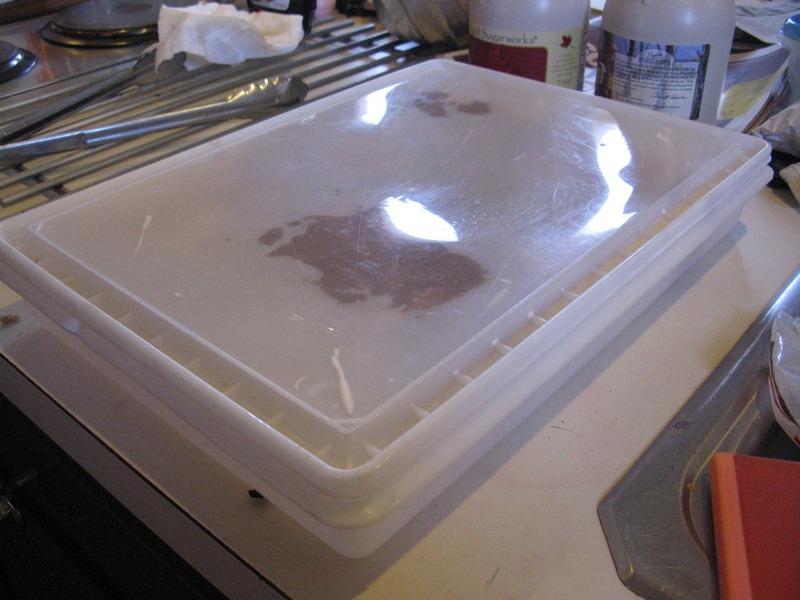 Instead, my wife found a handy plastic storage container, called a “fish tub” in the trade. The meat will cure inside this "fish tub"
Over the next week, I’ll be checking on my pork, turning it every other day and “redistributing the cure” as Ruhlman suggests. Meanwhile, I’ll be trying to track down some wood chips to use for the final smoking of my bacon. I’m so glad I already own a smoker. Stay tuned. The bacon roasting in the oven is pretty effective, but I’m dying to smoke some. I would love to read about your smoking and any tips and tricks you have. Perhaps, you can inspire me to buy one and finally do it. That would be pretty great. PS: Oh yes, we definitely need an anthem. Suggestions? Oh yes! Mrs Q is right. We’ll have a blast at Blogher Food. Are guys invited to this gig? Y’all do know I’m not female, right? Hey, just wanted to note typically you use insta cure #1 for bacon. 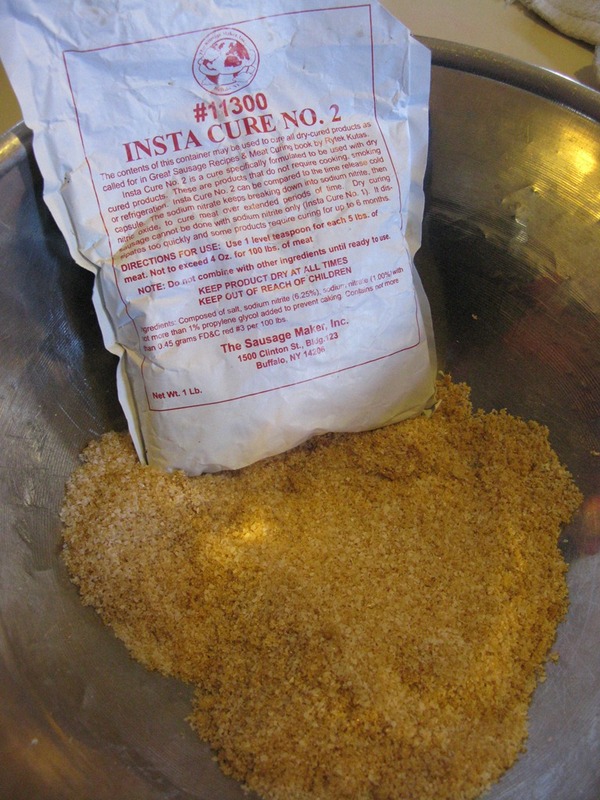 insta cure #2 (the picture above) is usually for curing meats over an extended period of time (eg salami, etc).